In many environmental histories, diseases serve to make one of the field’s foundational claims: that nonhuman forces matter in the shaping of human events. But as environmental history has matured, its practitioners have recognized that diseases are entangled with the human-made world, and that to reduce diseases to their nonhuman aspects is to risk naturalizing them in distorting ways. Yellow fever—which shaped the Atlantic World from the middle of the seventeenth century through the early twentieth century, ravaging port cities, killing hundreds of thousands of people, and upsetting trade and geopolitics in the region—is the perfect example of a disease that entangles the natural and the cultural. What is yellow fever? At its most basic, yellow fever results from a virus invading a susceptible human body. Recent phylogenetic analyses suggest that the yellow fever virus is approximately 1,500 years old and emerged among primates in the forests of Central Africa. From there the virus spread to humans, making its way to West Africa where it eventually boarded ships, likely during the slave trade, and traveled to Europe and the Americas. Yellow fever’s spread was the same as the virus’s spread. But the virus itself is a protean thing, and it does not always result in what we have come to recognize as yellow fever’s signature symptoms—jaundice, high fevers, hemorrhaging, vomiting of coagulated blood, organ failure, and, often, death. In fact, approximately 80% of people infected by the virus suffer only mild symptoms, and all who survive it enjoy life-long immunity. The virus may be the defining feature of the disease, but its presence does not always produce the disease in a uniform clinical manifestation. 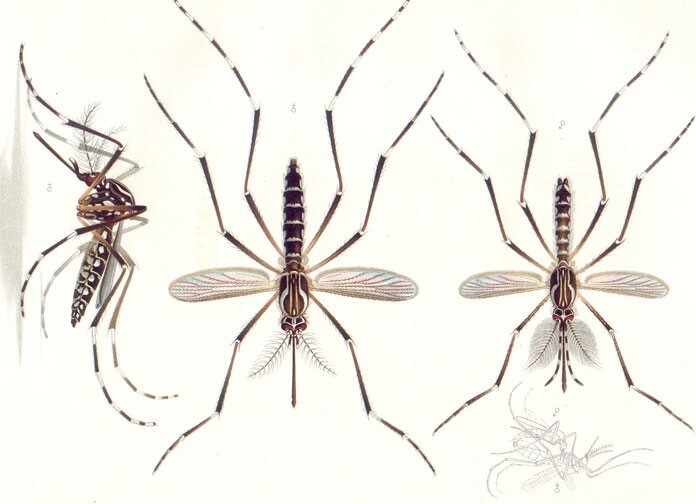 Aedes aegypti from E. A. Goeldi. Os Mosquitos no Pará. Memorias do Museu Goeldi. Pará, Brazil, 1905. Click here to view Wikimedia source. Mosquitoes transmit the virus, and they too shape the forms it takes. Historically, the chief vector was the Aedes aegypti mosquito, which transmitted the disease between humans in its epidemic form (yellow fever continues to circulate among primates in Africa and the Americas in a sylvan form with different mosquito vectors). Like the virus, A. aegypti may seem a part of nature, but it lives with humans in urban settings and breeds almost exclusively in human-made containers. The vector too is an African native that likely came to the Americas with the slave trade, but its evolutionary history comes with a twist. 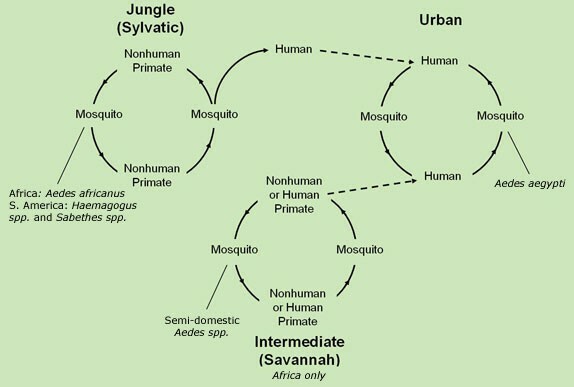 The urban vector descended from Central African tree-hole breeding mosquitoes, found only in forest canopies, that initially spread the virus among primates in its sylvan form. Scientists speculate that a drying African climate isolated a population of A. aegypti in North Africa several millennia ago and that they adapted to breeding in human water storage containers as their natural breeding habitat dried up. The virus and its urban vector may not have come together until the commerce of the Atlantic World linked them. The urban form of yellow fever, then—the form that ravaged the Americas in particular and, to a lesser extent, Europe—was the result of a specific historical conjuncture of virus and vector in the context of human transatlantic trade. They did not come out of nature into history, but out of particular natural and human histories. From Rupert Boyce. Yellow Fever Prophylaxis in New Orleans, 1905. London: Williams & Norgate, 1906. Click here to view Wikimedia source. Yellow fever was also a product of the human ecologies of Atlantic World port cities. Two conditions of such cities are noteworthy. First, A. aegypti bred in urban areas where people collected their drinking water in barrels, cisterns, and other containers. The story is more complicated than that, but the sanitary implications were simple once researchers confirmed the vector in 1900: eliminate such forms of water collection and you largely eliminate the disease. 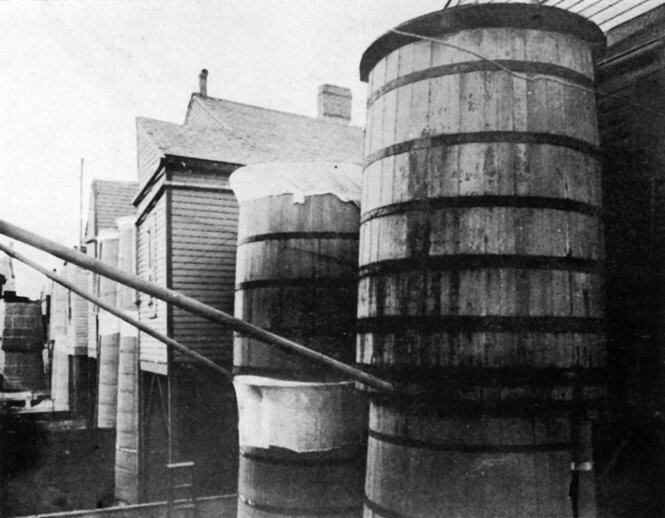 Second, because they provided such prodigious vector breeding conditions, and because most people infected with yellow fever suffer only a mild case and emerge with life-long immunity, these water collection systems functioned unintentionally to inoculate local populations. As a result, most people who lived in tropical and subtropical American port cities whose trade networks circulated the virus enjoyed immunity to yellow fever, and it was only in urban areas to which nonimmunes migrated consistently and in high numbers—New Orleans, Havana, Rio, the Isthmus of Panama—that major outbreaks occurred. This graphic was produced by the Centers for Disease Control. Click here to view image source. What then is yellow fever? It is a set of clinical conditions caused by a virus, which developed and spread quite recently in the larger scheme of earth history, and a mosquito vector with a particular historical ecology and co-evolutionary history with humans. Yellow fever emerged as a disease of historical import under conditions of early modern Atlantic World commerce and migration, and it relied on specific port-city infrastructural, social, and economic conditions for its perpetuation and proliferation. All of these conditions shaped the patterns of human suffering that we have called yellow fever. But yellow fever is also something more. In Africa, yellow fever takes a different form. While it can exist in both urban and sylvan forms there, its most important cycle of transmission, unique to West Africa and Angola, occurs in wet savannah environments where another set of vector species spread the disease. In a sense, yellow fever is a different disease complex in Africa than it was (and occasionally still is) in the Americas. Treating yellow fever as a natural thing has allowed us to ignore these differences, and to tell stories of yellow fever coming out of Africa and into history. Yellow fever may be substantially caused by nonhuman forces, but to treat it merely as a product of nature that shaped human history is to miss all of the ways in which its nature has history. Sutter, Paul S. “What Is Yellow Fever? Disease and Causation in Environmental History.” Environment & Society Portal, Arcadia (Autumn 2017), no. 31. Rachel Carson Center for Environment and Society. doi.org/10.5282/rcc/8123 (link is external). Espinosa, Mariola. Epidemic Invasions: Yellow Fever and the Limits of Cuban Independence. Chicago: University of Chicago Press, 2009. McNeill, John. Mosquito Empires: Ecology and War in the Greater Caribbean, 1620–1914. New York: Cambridge University Press, 2010. Monath, Thomas P. and Pedro F. C. Vasconsuelos. “Yellow Fever.” Journal of Clinical Virology 64 (2015):160–173. Sutter, Paul. “The First Mountain to Be Removed: Yellow Fever Control and the Construction of the Panama Canal.” In Environmental History 21, no. 2 (2016):250–259. Covart, Liz. "Thomas Apel, Yellow Fever in the Early American Republic." Ben Franklin's World 174, February, 2018. Willoughby Engineer, Urmi. “The Ecology of Yellow Fever in Antebellum New Orleans." Arcadia 2018, no. 1. Paul Sutter is a professor of History at the University of Colorado, Boulder. He received his PhD from the University of Kansas in 1997. He was a postdoctoral fellow at the University of Virginia from 1997 to 2000, and then a member of the History Department at the University of Georgia from 2000 to 2009. He is the series editor for “Weyerhaeuser Environmental Books,” published by the University of Washington Press, and he was the founding editor of the “Environmental History and the American South” book series published by the University of Georgia Press. Paul has held fellowships from the Smithsonian Institution, the Huntington Library, the National Endowment for the Humanities, the National Institutes of Health, and the Rachel Carson Center. He is currently working on a book, tentatively titled Pulling the Teeth of the Tropics: Environment, Disease, Race, and the US Sanitary Program in Panama, 1904–1914, which interprets American expansion and imperial public health through the lens of environmental history.